The ultimate 'geek-chic' ride can be chartered to next year's 2013 International CES (Consumer Electronics Show) in Las Vegas Jan. 8-11. The airline is teaming up with Gilt City to offer a "nerdbird for hire" charter flight. 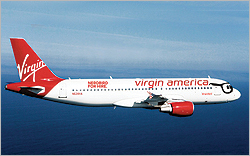 One lucky purchaser will score the chance to travel to the 2013 CES with up to 135 of their friends or colleagues, onboard a new Virgin America Airbus A320 commercial jet appropriately named #nerdbird. As part of the deal, the purchaser gets the ability to custom brand the exterior of his or her ride for the month of CES. The airline is promoting the offer at http://www.giltcity.com/national/nerdbird. Images of a branded #nerdbird can also be found here. For those who don't wish to purchase an entire flight, the carrier also is offering a Cyber Monday fare sale, with an additional 10% off fares. The first 3000 who bought a ticket Nov. 26 received a gift with purchase: A free Gogo in-flight WiFi pass for their next flight. All of Virgin America's aircraft are outfitted with amenities like power outlets at every seat, touchscreen seatback entertainment platforms and WiFi. The airline is the only U.S. airline to offer in-flight WiFi on every plane in its fleet and was the first airline to launch Gogo's new next-generation higher-bandwidth ATG4 WiFi as of this fall. The company gets inquiries every year from local tech companies and entrepreneurs asking to charter aircraft to head to CES, said Luanne Calvert, vice president of marketing at Virgin America. “So we thought it would be fun to answer the call and work with Gilt City to create the ultimate geek gift," Calvert said in a release. "Plus, if being the first airline to offer fleetwide WiFi and having an entertainment platform that runs off LINUX isn't evidence enough, we're kind of geeks ourselves." This is not the first time that Virgin America and Gilt City have teamed up to offer unique rewards and packages for savvy travelers. Virgin America worked with Gilt City in 2011 to offer a charter jet for hire on Cyber Monday. The offer sold in seconds.